The day after Thanksgiving, our friends Josh and Jules came over to play board games, sip aperatifs, and eat leftovers. Jules completely wowed me with this super intricate scarf that Josh's mom had made her. Around this time last year she was sporting another equally amazing scarf from Josh's mom too. I am the picture of jealously again! Check this thing out. 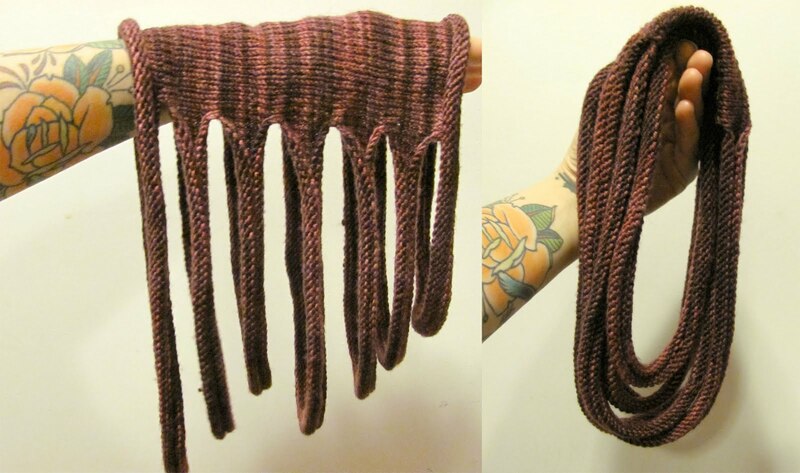 It falls beautifully around your neck as the rows varying in length. It is such a cool idea. I have no idea how to make something like this but if any of you out there have any idea I would love to know!! I think you can just knit in the round and bind off/cast on a huge stretch of stitches to make the "slits." You'll want to vary the amount you cast on in order to vary the length of the next slit. Good luck! It's gorgeous! Sparkly Glittery Scented Skull Soap!!! !